Do you have a clear and intelligent financial plan as part of your PhD or post-doc program? What if you don’t? It is never too early, or too late, to start. 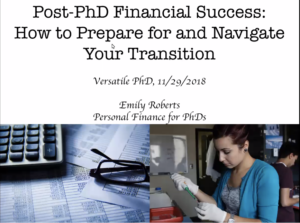 From planning for a potential post-graduation lapse in employment, to moving and taxation, lifestyle changes, student loans, savings plans and salary negotiation, Dr. Emily Roberts, Founder of Personal Finance for PhDs, has answers. Dr Roberts has also provided a follow-up Action Item list. Download it here.